Something reminded me of wallpaper this week. This would be a slightly more complete piece of writing if I could remember what the hell it was that reminded me but I can’t. Someone mentioned wallpaper and it slipped into my head, did nothing for a time, and then came back to exercise my brain. It reminded me of something I had completely forgotten and I don’t really want to forget it again so I thought it might be best if I set it down here and kept it safe. Dad was really good at wallpapering. Really really good. There. I shouldn’t forget it again now. I suppose the reason it slipped out of my mind was that I only really saw Dad wallpapering when I was a small boy. I think wallpaper may have fallen out of fashion after that or perhaps it was simply that the wallpapering Dad did was of such a high quality that he never ever needed to do it again. Yes, that was probably it. It’s the living room I remember best. I think we had just built a new partition to create a separate hallway between the front door and the back kitchen. Posh or what? And the resulting new wall meant that the entire living room had to be wallpapered. Dad had been an interior decorator before he had been the council rent collector so he approached this task with a large measure of professional confidence. The room was cleared and a huge folding trestle table appeared from someplace to dominate the space. There was a tub of sticky drippy paste and the widest brush I had ever seen. The wallpaper had a pattern on it but this didn’t seem to phase Dad one little bit. The technique, as I recall it, involved laying out the rolled paper over the trestle table, sloshing it with paste and then – and this was the first of the outlandishly skilful parts – the pasted paper was somehow folded over onto itself without the paste ever touching the patterned side. This folded sheet, the same length as the height of the room was then offered-up to the wall and confidently applied. That’s when the second magic thing happened. The pattern, it aligned precisely across one sheet and onto the next. Every single time. I had seen Dad fly-fish and had been justifiably amazed at the skill he brought to that but I had never seen him be professionally brilliant until that point. As it turns out, it was a lasting memory albeit a dormant one for many long years. As I write that, I suddenly remember where I heard mention of wallpapering this week. I think it’s in the book ‘Netherland’ by Joseph O’Neill which, incidentally, is a wonderful read. Sometimes I search in my head to remember little things about my parents. Those tiny inconsequential things that made them who they were to me. The big things are much easier, the love, the guidance, the late-night bollickings but the little things become ever more elusive. When they show up, from time to time, it’s good to hold on to them. 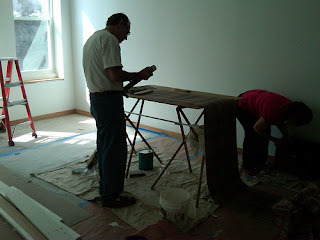 This re-found memory of the wallpapering, the trestle table, the folding technique, the paste-and-brush, it momentarily evoked Dad for me in a vibrant living/breathing way that bigger memories can’t ever seem to achieve. So roll on the small memories. I have a 'Happy Book' to write the small things down in. Sometimes I read my old Happy Books, and already, only 7 and 9 years on at the most, there are many things I would have forgotten about my children had I not written them down...so small were they, yet so very very big and important. There are worse things to be had than an ordinary life peppered with small moments of happiness. Happy Easter Mr Armstrong :). This very simple piece made me think of my dad. Of my mum too, and my childhood home, which is always nice. And of course, it made me think about wallpaper associated memories. Happy times. Now you mention it I do remember my dad wallpapering. Like your dad he was born into a generation where that was what you did, you wallpapered your rooms. I remember helping him and hating it—I really hate to get my hands sticky (I am not in touch with my food). I hung (hanged? neither looks right) wallpaper in my first flat. It was an interesting experience. It was embossed, little diamonds. I only did the one wall and it was dizzying to look at it when done but once the fireplace and the mirror went up to break up the expanse it looked fine. The kitchen was another thing entirely. The wallpaper was heavy and maybe it was the heat or maybe I didn’t use the right paste but it kept coming off. I ended up nailing most of it to the wall. I jest not. Good with my hands I am not. The wallpaper was in the shape of tiles with thick black rims and the rims were perfect for nailing carpet tacks into. I can only imagine what the people who moved in after us thought. That was, I think, the last time I ever handed wallpaper—I was nineteen at the time. After Dad died I did strip the walls in my mother’s living room for my sister and her husband to wallpaper when they came up. That was actually fun. The first time I’d used a steamer. A wonderful tool. My sister and her man took it away with them and they’re welcome to it. I’ve no intention of ever wallpapering again or doing any DIY if I can possibly avoid it. Even the thought of getting a man in to do stuff—the carpet in the living room could do with being replaced—keeps getting put off. Maybe once the bird dies—if the wee bugger ever dies—we’ll use that as an excuse to smarten up the place.